Albert, Righter & Tittmann designs a modern interpretation of a shingle-style home for a multi-generational family. The house has a gambrel roof, minimal trim, and an informal character in keeping with the surrounding community. The stair winds up and over the main entry. The shingle style is a uniquely American style of architecture. 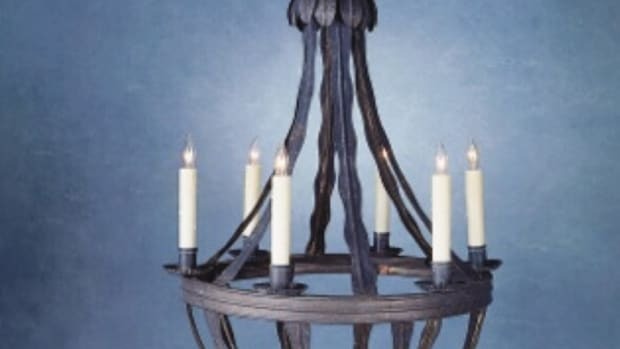 Galvanized by the 1876 celebration of the Centennial, architects looked to the material and forms of early Colonial American homes for inspiration. They rejected the precise symmetry and formality of more classic styles of architecture and brought an organicism to the overall structure of the residence. 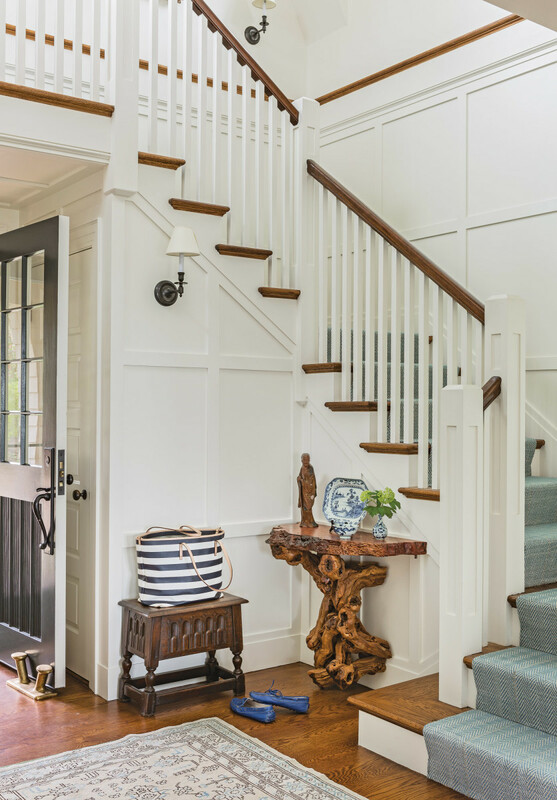 Instead of arranging rooms on either side of a central hall, shingle-style homes are a warren of small, interconnected rooms that create a cozy and informal atmosphere. 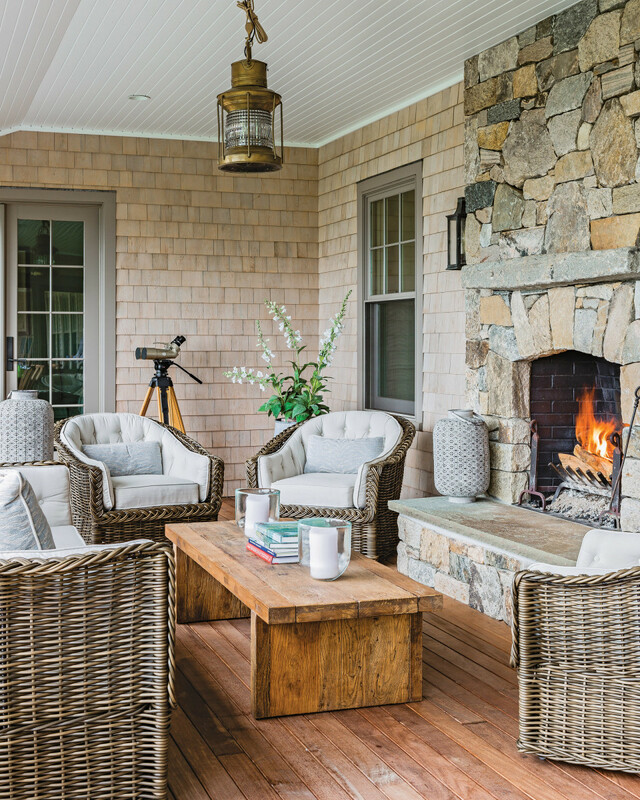 When Jacob D. Albert, AIA, of Boston’s Albert, Righter & Tittmann Architects, was brought on to design a home on an island off the coast of New England, he had plenty of history for inspiration. 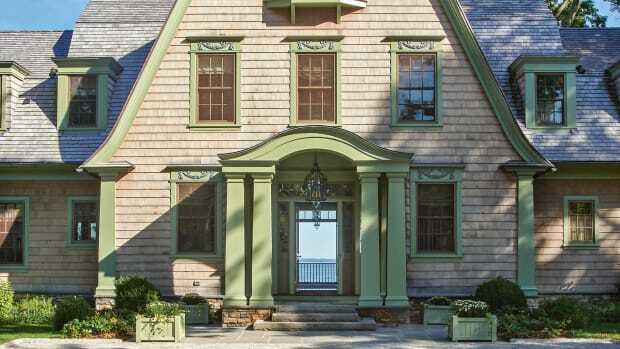 “There is a tradition of shingle-style houses in this community, and the homeowners wanted to make their new house fit in with that tradition,” says Albert. 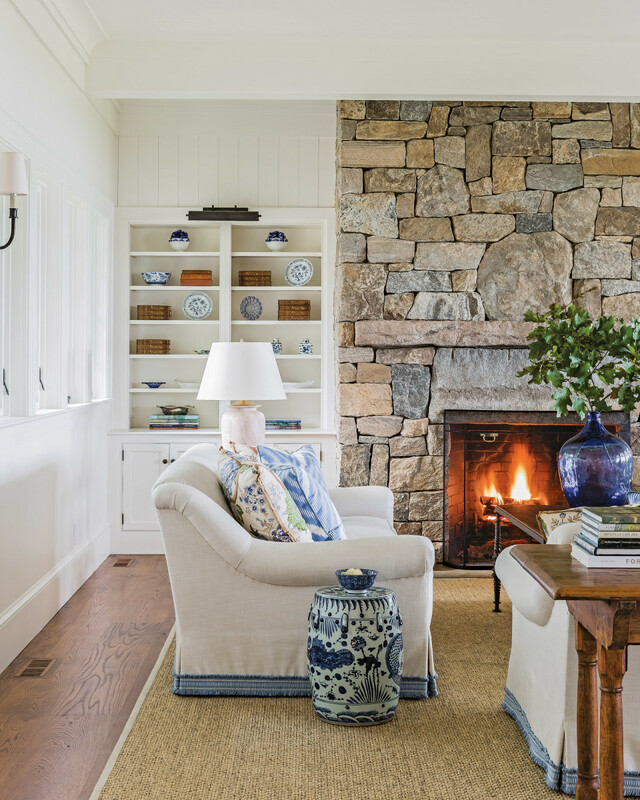 A massive stone chimney is a dramatic focal point in the living room. 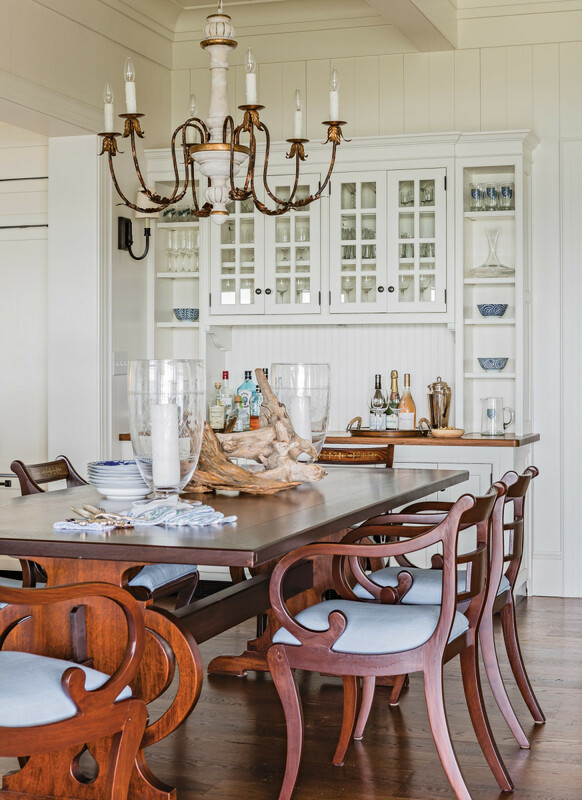 In addition to wanting a home that would fit into the island community’s traditions, they also wanted a home that would meet the needs of their growing, multi-generational family. 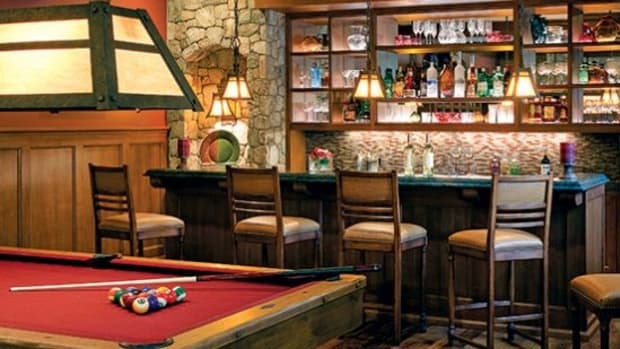 With three adult children and a number of grandchildren, the homeowners knew they wanted private suites for their children and their families as well as plenty of room to gather everyone together. Furnishings are kept formal yet comfortable. 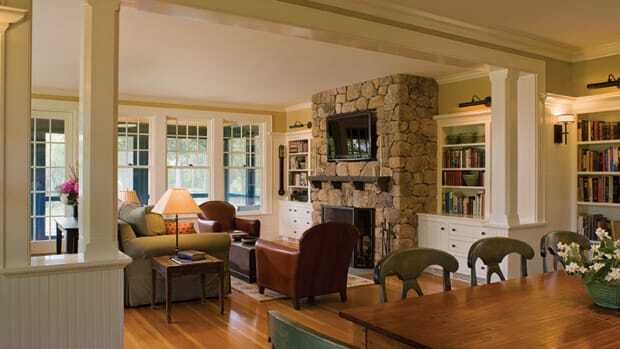 The central part of the home is one large room that includes the kitchen, dining area, and living room. The open floor plan takes advantage of the natural light and cross-ventilation and is organized for modern living. French doors open from the kitchen to a large porch overlooking the harbor. In the summer months, the screened-in portion of the porch becomes the main dining and living space, and the massive stone fireplace creates a cozy room where the family can come together on cool summer evenings. The back of the house is defined by this large porch, which runs the entire length of the house. 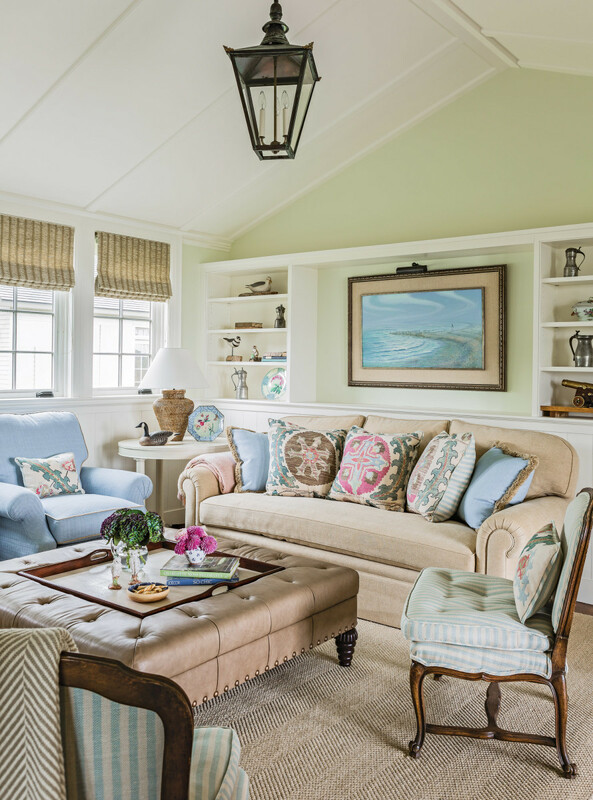 It is paralleled by a dormer that extends across the second floor and provides the upstairs bedrooms and the homeowner’s study with natural light and a stunning view of the harbor. A massive stone fireplace mimics the interior living room space. Downstairs, two sets of guest bedrooms are set off in their own pavilion-like wings, one on each side of the main house. Small, single-story hyphens connect the pavilions to the main house. These guest suites include a pair of private baths and give family members and other guests a quiet retreat away from the central gathering places. 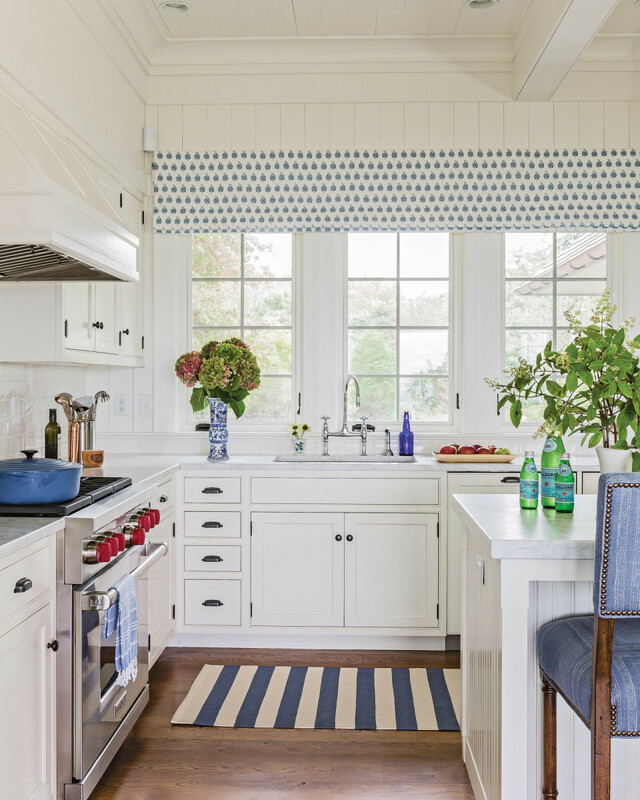 The built-in china cupboard offers ample space for dishes and a bar. The kitchen offers modern appliances set in a traditional design. Indeed, shingle-style homes were designed to fit in with their natural surroundings and made for New England’s rocky coastline. The horizontal emphasis of these homes creates a gentle transition from the built to the natural environment. And for a family that has spent summers on this small island for generations, it is the perfect fit. 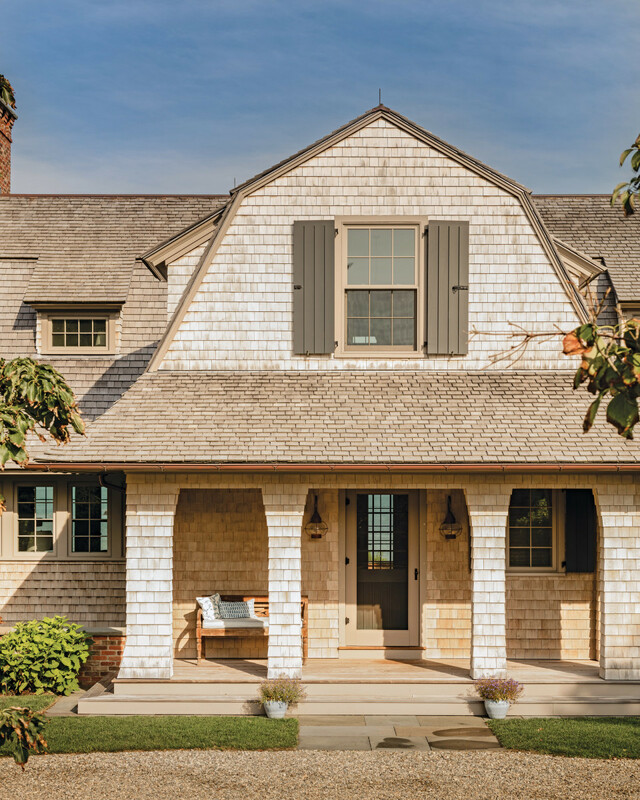 Albert, Righter & Tittmann Architects design a Shingle Style home on a coastal farmstead in Massachusetts. 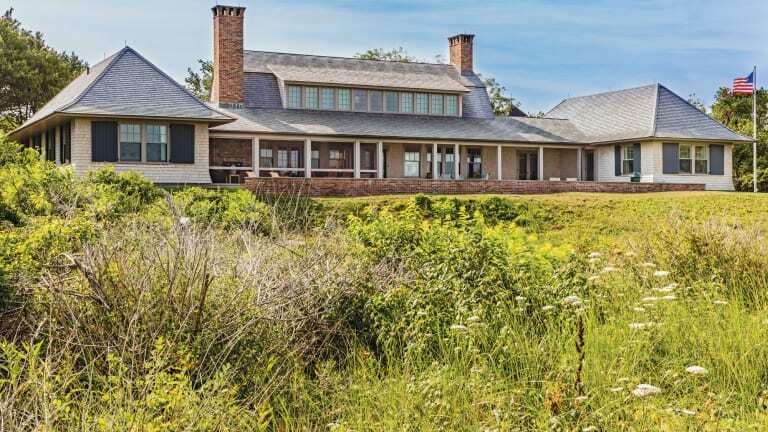 Austin Patterson Disston Architects creates a timeless design on a rocky ridge in Rye.